Knowledgeable industry professionals have called Transformix's remarkable CNCAssembly® technology the most significant breakthrough in automated production systems in 40 years. Blurring all distinctions between the conventional technologies of robotics, palletized transfers, indexing motion, and continuous motion systems, CNCAssembly® brings to automated production systems an unmatched combination of speed, flexibility, and precision that outclasses all of its predecessors. CNCAssembly® Systems function as "n-axis robots" - that is, as networks of distributed, electronically synchronized servo motors integrated into systems of extraordinary efficiency and extraordinary versatility. This unmatched industrial automated solution optimizes the performance levels for manufacturers across a wide spectrum of industries, increasing return on investment and eliminating wasted resources. At the core of CNCAssembly® is Transformix's patented RSM Technology®, a major breakthrough in motion control that virtually eliminates non-value-added motion delays. 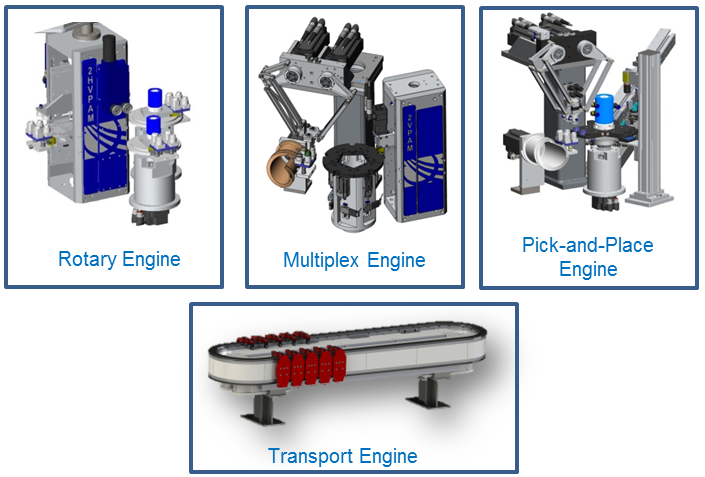 RSM Technology® is the foundation on which "Engines" are built - that is, standard, independent, highly integrated subsystems that carry out various processing functions. A single Engine can replicate the work of up to twelve conventional machines at high rates, requiring 80-95% less tooling time and utilizing a fraction of the footprint. Accommodation of Multiple Product Variants. To dramatically increase the internal efficiency of your manufacturing process, contact a seasoned professional at 1-800-639-5644, or send an email to info@transformix. A short video of a CNCAssembly® Platform configured for the assembly of a basic 2-Part product. The video will give you a quick view of capabilities of the patented technology.